May 19, 2017, ©. Leeham Co: Last week we described the different working groups and review committees and boards involved in defining a new airliner’s maintenance requirements. We now continue with describing a practical maintenance task from the maintenance plan for a common aircraft, the Airbus A320. Figure 1. 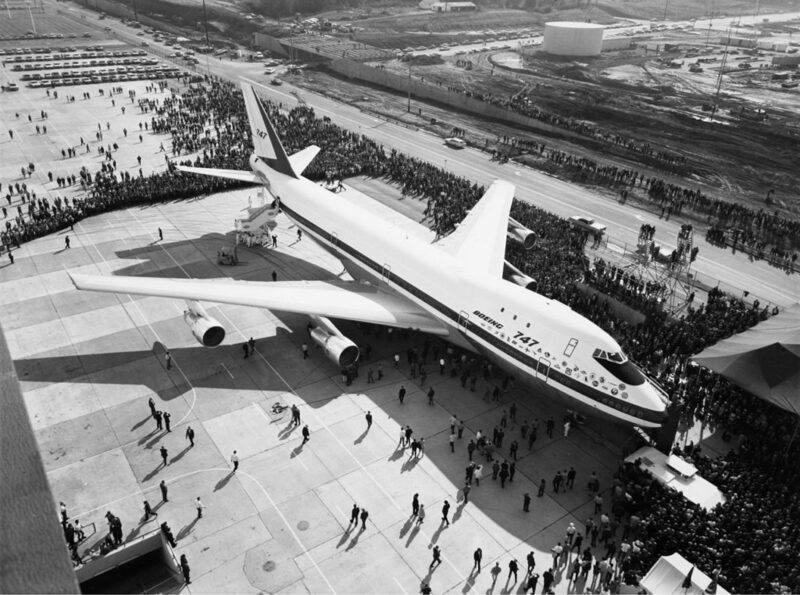 The first modern maintenance program was formed around the Boeing 747. Source: Wikipedia. The ultimate responsibility for keeping an airliner fit for purpose lies with the operator. And the operator is responsible to his local airworthiness authority (the FAA in the US, the authority in the operator’s Air Operators Certificate (AOC) country for non-US airlines). These authorities have additional requirements on top of what the Maintenance Review Board Report (MRBR) prescribes. The requirements are described in Certification Maintenance Requirements (CMR, contains maintenance task that must be done to keep the Type Certificate) and different Airworthiness Limitations documents (AL, e.g. tasks to inspect fuel tanks to prevent arcing or fatigue hard limits for structural parts). To this shall be added Airworthiness Directives (ADs) such as Service Bulletins (SB, modifications that shall be made to the aircraft). All these inputs are gathered in the Maintenance Planning Document (MPD) issued by the aircraft manufacturer. 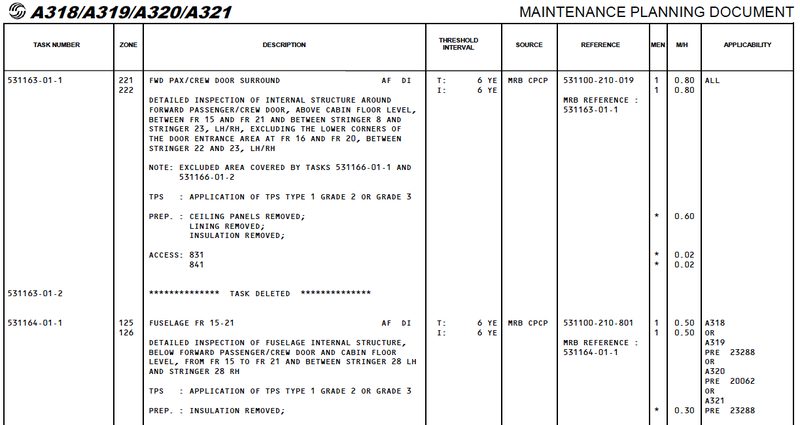 We will now look at an entry in a Maintenance Planning Document for the Airbus A320 series. Figure 1 shows the maintenance instructions for an inspection of the passenger doors surrounds. Figure 1. MPD task to inspect the structure around the passenger doors. Source; Airbus. Click to see better. The Task number. Each task has a unique task number where the first six positions form an ATA (Air Transport Association of America) identification number, telling what part of the aircraft is involved. The aircraft Zone where the task shall be performed. We will discuss Zones and Zonal tasks in the next Corner. Description on what shall be done. Further, what skill is needed (AF=Airframe knowledge), the type of action (DI=Detailed Inspection) and what preparation and access is needed (the numbers are the doors/panels that need to be opened/removed). TPS stands for the Temporary Protection System that shall be applied after the task (anti-corrosion treatment). The Threshold/Interval column describes the trigger criteria for the maintenance action. Here, the first trigger (T for Threshold) is six years and the Interval (I) is also six years. Source describes from where this task has come. MRB stand for Maintenance Review Board, CPCP for Corrosion Prevention and Control Program. Reference gives links to the task in the Aircraft Maintenance Manual and to the MRB report. Men says how many persons are needed to do the task. M/H stand for Man Hours to complete the task. Applicability says if it’s applicable to all aircraft models in the A320 series or to only a few variants like the next task. The task is followed by a deleted task for this revision of the MPD and a fuselage inspection task. A Maintenance Planning Document (MPD) contains thousands of such tasks. We will give more examples and go through how the tasks are grouped into different types of maintenance checks next week. ← Regional aircraft for US Scope clause operations. Part 3.